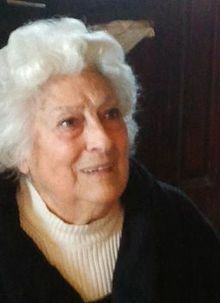 An obituary published in April 2015 on the occasion of the death of Teresa Rebull (1919-2015)—scion of a well-known libertarian family, sister-in-law of David Rey (a/k/a Daniel Rebull, co-founder of the CNT), textile worker at the age of 12, member of the POUM since 1936, volunteer nurse during the Civil War, participant in the May Days of 1937, prisoner of the Stalinists in a “cheka” in Barcelona, exile in France, participant in the French Resistance, and singer-songwriter of the Catalonian folk music revival of the 1960s, among other things—a remarkable woman and one of last survivors of a generation of women who “tried to win the war by carrying out the revolution”. Teresa Soler Pi, known to us as Teresa Rebull, has died. The daughter of well-known CNT militants, she was herself a POUM militant, along with her comrades Pep Rebull and her brother-in-law, the legendary David Rey. She was an exile, a member of the resistance, the grandmother of the New Song movement,1 and the friend and comrade of the Andreu Nin Foundation. Once, during the course of a celebration in her honor, when I said I was thinking about mentioning how old she was, she vehemently insisted that I should say, when she dies, that she wasn’t a day older than thirty. And true enough, she died young; she was always young. She was one representative of a generation of militant women. Some of them, such as Katia Landau, María Teresa García Banús and Teresa Soler Pi, better known as Teresa Rebull, played an outstanding role in their times, along with people like Pep Rebull, the man from Cell 72, who openly criticized his party’s actions during the war; or like her brother-in-law, Daniel Rebull, also known as David Rey, one of the founders of the CNT, an activist who participated in legendary strikes, the co-founder of the Communist Party, the Workers and Peasants Bloc, and later, the POUM, known as the Spanish Blanqui because of the years he spent behind bars, details that emerged in a multitude of interviews and documentaries like the one produced by Jordi Gordon, doubly forgotten. In some of her more recent accounts, written in a lyrical style, she said that the POUM “was more than a party”. Despite the fact that its name seems to refer to a political fraction or association, it was in fact the confluence of a wide range of cultural activities: popular cultural centers (ateneos), theater groups, associations for the dissemination of scientific knowledge, youth groups, hiking and camping clubs and neighborhood sports teams, cooperatives and trade unions, and institutions like the “Centre Autonomista de Dependents del Comerç i de la Industria” (CAPCI), which were strongholds of the insurrectionists of the strike of October 6, 1934. During the war she worked as a nurse. She was an active participant in the May Days of 1937, as a result of which she was arrested and held in a Stalinist “cheka” on the Vía Laietana, where she was interrogated concerning the whereabouts of her boyfriend and also of Manuel Maurín, Joaquín’s brother, with whom she maintained very close “ties of affection”, and who was to die shortly thereafter. Teresa managed to escape from the “cheka” just as Franco’s troops were advancing through the outskirts of Barcelona. She was twenty years old when she fled into exile in France. She survived thanks to the help of a couple who were Pivertiste militants (supporters of Marceu Pivert, a left-wing socialist leader who was very close to the POUM during the Spanish war), and she joined the Maquis. After the war, she vividly experienced the wave of euphoria of the Parisian left during its artistic and cultural awakening, she got to know Camus, Sartre and the Trotskyist Jean Malaquais, and singers like Juliette Greco, and she enthusiastically participated in the events of May ’68, which is when she began to be recognized as a representative of the New Song movement (la nova cançó). Teresa is considered to be a pioneer in the cultivation of Catalan folk music in northern Catalunya. During her long years in exile, Teresa continued to participate as a militant in the POUM, and that is how I remember her, as the lively militant at the POUM meetings on the rue d’Aubriot. Enveloped in an aura of considerable fame as a lover of bohemia, and personally acquainted with the most emblematic personalities of existentialist France, she never abandoned her profound mistrust of the “communists”. On one occasion, after having listened to my account of my misadventures in the Workers Commissions (Comisiones Obreras), she had a very maternal talk with me and warned me that I was being very naive and that I must never trust the “communists”. Shortly afterwards I became acquainted with her abilities as a singer at a recital organized by the Casal de Catalunya in Paris—I think it was held at the Odeon—featuring various representatives of the New Song movement that everyone was talking about and concerning whom someone had said that Teresa was their grandmother, not only because of her age but also because she had preceded them in the practice of the art. That day she sang songs like “Serra de Pandols” and “La Campana”, written by Mikis Theodorakis for the Greek resistance. I was completely overwhelmed. To me it still seems to be one of the most beautiful revolutionary songs of a generation. Her performance expressed the will of those who dared to say “no”, to fight for life and revolution in the most comprehensive sense of the term. During her last years, Teresa took part in various conferences of the Andreu Nin Foundation, such as the one commemorating the kidnapping and murder of Andreu Nin and Camillo Berneri, held on June 16, 2007 at the Palau de la Virreina. In her wheelchair, she attended the united conference of all the left wing groups from the heirs of the PSUC to Revolta Global … in a gesture that was a “never again” to Stalinism. With the death of Teresa, we have lost one of the last of the women who tried to win the war by carrying out the revolution. Pepe Gutiérrez-Álvarez was a militant in the Revolutionary Communist League and is the author of many books and articles on the history of the working class movement and film criticism. He is currently the Vice President of the Andreu Nin Foundation. Original title: “Teresa Rebull, morir a los 30 años”. 1. “La Nova Cançó”, a cultural movement that sought to rejuvenate the tradition of Catalan folk music and language and to challenge the injustices of Franco’s dictatorship. 2. The French equivalent of the “Grammy Awards” of the U.S. National Academy of Recording Arts and Sciences.